Look, I have nothing against deep convictions, or the passion to defend them. But there’s a fine, and murky, line between that and bigotry. You’d think rescuers, being so compassionate, would extend at least some of that compassion to fellow humans, even to the ones who aren’t quite there yet in terms of illumination, those whose understanding of the stuff that really matters (It’s About The Dog) is somewhat under-developed. You want to make an enemy for life? Piss off a rescuer. Granted, we probably won’t get pissed at any of the ‘normal’ stuff, like you standing us up for a date, or posting an unflattering photo of us on Facebook; it’ll be over the fact that You bought a puppy WHERE??? Or because you moved and, instead of bringing your dog along, you rehomed him. Or maybe you happened to mention in passing that you’re looking for a purebred male to breed your pedigreed Afghan hound. Whatever it is, chances are you won’t understand what you did wrong. But the consequences will be swift. And thus the fierce hand of god smote the heathen heretic in holy righteousness. I am not free of sin, so this isn’t about throwing stones—or, rather, if any stones need to be thrown, this is me volunteering as target practice. The truth is that it’s this zealot attitude of rescuers that gives all of us, even large-scale organizations like PETA and Greenpeace, a bad name. If rescue is about improving the quality of life for animals, those of us involved in making it happen need to rethink our strategy. I don’t mean that we all need to become fake-smiley PR-ey lobbyists, but… Maybe just, you know, tone the bigotry down a notch. It is, after all, About The Dog. This has been an amazing month, and an amazing Challenge. You know, I almost didn't do this A-Z of Dog Rescue series. I spoke to a few (non-blogger) people about the theme, and none seemed thrilled. Up until the Theme Reveal in March, I was still debating... Should I, shouldn't I. In the end, it wasn't conviction that won out but a lack of any other alphabet-friendly ideas—and never have I been happier that the brainstorming failed. I knew the series would appeal to only a select group, but I never imagined the group would be so large, so diverse, so warm, so full of intelligent input and marvelous stories to share and enrich these posts with. It has been so rewarding to have so many repeat visitors; it feels like we've built a little community here, and I'm honored by that. I look forward to staying in touch, both here and at your own blogs—I've discovered so many fabulous ones this month!—throughout the year. For a wonderful month. For all your encouragement (it's thanks to you that these posts will soon be collected into a book!). For the love you give, have given, and will give to your furry four-legged family members, if you have them. For the interest with which you've followed this series if you don't. For every comment, every share, every suggestion. For... well, everything. Masha danki is 'thank you very much' in Papiamentu, the language of Curaçao. And it's never been said as heartfelt as today, to you. The passion drives us to action. That passion can create all kinds of good things. That passion can test our patience when people stand in the way. Give and take is something we all work on. The book will be such a terrific resource. I have always wanted to do more for animals. My calling is people and animals help me immensely. I would say I have rescued animals. But these animals have worked too hard to not acknowledge their worth. I experienced this with the SPCA before. I adopted a young border collie from the SPCA (we had adopted a McNabb border collie from a person about 10+ years prior and the dog had recently died). When I got the new dog home it was very interested in our pet dwarf goat. I gave it a few days to see if the dog would calm down with it's obsession with the goat, but it just got worse. After I few days I took the dog on a leash by the goat pen and the dog wanted to kill the goat and our chickens. At the time there were so many cows, horses, goats, sheep, and chickens at neighboring houses, I knew this dog wasn't a good fit for our home. After three days I ended up taking the dog back to the SPCA and explained the situation with the dog being aggressive towards livestock, they acted like I was the worst person ever. It was horrible. I'm so sorry to hear about th bad experience you had with SPCA... Yeah, dog people can be the worst bigots (I'm guilty of it, too, so I should know ;) ). You did the right thing, though; that dog wasn't a good fit, and bringing him back was the best possible solution. I wonder, though, whether it's precisely the kind of "disapproval" you experienced with the SPCA people that plays a role in so many dogs being abandoned. People with a lesser sense of ethics than you might want to avoid the hassle and just turn the dog out into the street... or rehome him/her, which might lead to the street (or abuse, or worse) anyway. We—the dog people—really need to curb our zeal. I'm so glad you're turning these posts into a book, Guilie. What a wonderful resource for anyone who wants to become an active dog rescuer! Congratulations on your success with this challenge. Thank you, Susan! Your enthusiasm goes a long way towards motivating me... I'll look forward to sharing the A2Z-into-book process with you—but I can assure you right now that your feedback throughout April has already added immensely to the quality I hope to deliver. Thank you so much! Congrats on completing the challenge! And congrats on collecting this information into a book. That sounds like a great idea. The problem is, I get all teary-eyed when I read your posts. By the way, remember the guest post you wrote on my blog the year before last? It still makes me cry a little... I was fondly looking at it last week. Thank you Guilie - you rightly said that every area in life has its zealots, some more painful than others. I think this post series is going to make a fantastic book and I look forward to putting you on a pedestal :) Hugs! I think people don't often realize they've strayed into zealotry territory. They get blinders on. It's sad, but it's something we all suffer from. Best we can do is have a friend point it out and help us. You're so right, Patricia... And yes, we all suffer from zealotry in one way or another. We really need to do a bit of reality-checking every now and then, just to make sure. Like I said, nothing wrong with strong opinions—but when our attitude starts getting in the way of the long-term success, then yes, there *is* a problem. I'd never thought of dog rescue zealots. But I'm sure you're right. I'm not confident enough to be one when it comes to dogs or anything else. I like the concept of the Beginner's Mind where you're open to learning. That often stops me from making mistakes and a fool of myself, too. :-) Great to meet you during the AtoZChallenge! And congrats on finishing. You chose a great subject for the A to Z. A hard subject for sure, but such great advice and not just for the rescuer -- all dog owners. I'm thrilled that you'll get a book out of it. I've seen a few other blogs with that intent! I wish you a happy A to Z end. and a Happy May! I have thoroughly enjoyed this month, reading your posts. They have been enjoyable, heart rending, enlightening and fun. Congratulations on completing the challenge!! Masha danki to you, my friend! You have done an amazing and tremendous job of educating us all on the topic of Dog Rescue and have provided so many wonderful resources. It will make a fantastic book and you know I'll be first in line to buy it. I'm incredibly honored to have been a small part of your huge undertaking: Thank you for letting me tell Bella's story. And especially thank you for all the hard work and all the love you put into the rescue community. Bravo on a job well done. Take a bow. You deserve a ton of accolades. Now, here's the extract from Joseph's email to me - and thank you again for this series and for completing it! Whew! And thank you for your kind comments on my blog! 'I am pleased to learn about Guillie's series on Life in Dogs!. I am a "softie" about buying good dog books. Within the last two days, I bought 2 copies of a dog book, one for me and the other for my friend who lives nearby me in my metropolitan area. The name of the book ordered is INSIDE OF A DOG, What Dogs See, Smell, and Know. This is a #1 national Best Seller! The author is Alexandra Horowitz. Alexandra teaches psychology, animal behavior, and canine cognition at Barnard College, Columbia University in New York. I would not be surprised if Guillie already owns this book. I salute her for doing a series in A to Z about Man's Best Friend. 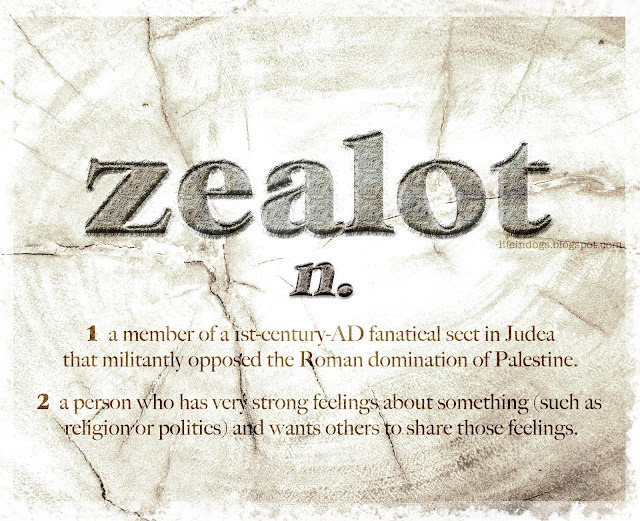 Your Zealot article tells it like it is. There are so many people who don't even recognize that they have become Zealots. They sprout an attitude of caring for animals or for the world climate but they have forgotten that life is a plurality of things and not a singularity because they are blind to whatever is going on around them. I look for the day when we start listening and observing not from a tunnel viewpoint but through glasses that make us friendly and open to what is around us. I think this was a truly unique idea and the A to Z challenge needs as many of those as possible. I can see how people who are directly involved with dog rescue would easily get frustrated by the uniformed, but you are right. Being nasty to the uneducated won't help the cause. Congrats on making it to the end of the challenge - and thank goodness for zealots, or there would be a lot more homeless (and dead) dogs today! Congrats on surviving the A to Z! I loved your theme and I'm glad I stumbled upon your blog. It was great getting to know you and I'll be seeing you around! I can totally understand the frustration that must come when someone gives their dog up for kind of a crappy reason. I'm a little confused about the pure bred issue though. I mean those dogs can't help being bred to make money and they still deserve a loving home. P.S Sorry I'm late commenting on your last two posts, I got a little behind on commenting in the last few days of the challenge! Yes! Zealots ruin so much for the normal people involved in a group, be it animal rescue, types of diets, religions, life philosophies, you name it. People on the outside, who don't know much about the group to begin with, tend to assume everyone's that over the top and out of touch with reality.